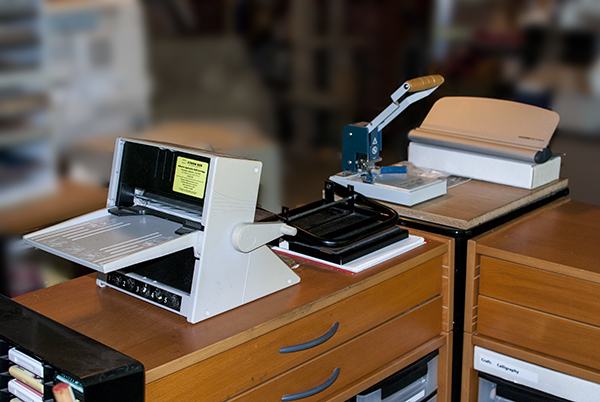 If you are a long-time VSN reader and/or you have the July ’00 VSN, you may remember these wood units from IKEA as being at the center of my stamping area at that time. Back then, the two IKEA units were in a L-shape, similar to how they are now, with the one on the right backed up against the side of a tall filing cabinet. Opposite of the left unit was a low black two-drawer horizontal filing cabinet, turning the L-shape into a U. I did my stamping on the right IKEA unit (the center of the U-shape) and used the surfaces on either side to accommodate supplies in use or things that needed to dry . . .
. . . OK, let’s be honest. All of these surfaces tended to accumulate things that I would neglect to put away after each stamping session, leaving a mess. That made entering this U very claustrophobic and unwelcoming. This is a big reason for why I reorganized and moved my stamping work area over under a window. (I’ll show you that another day.) The filing cabinets have moved elsewhere too, leaving these two IKEA units as open island space in the middle of my craft area. If you look at the lower left corner of the photo (above), you can see that my close stamping supplies storage (that I showed you a couple of days ago) now butts up to the left IKEA unit. The top of the right hand IKEA unit is currently mostly empty space. The pile of large white paper is there because I use white paper under my stamping a lot when I’m photographing how-to steps for eArticles and I go through a lot of it. My hope is that I’ll be able to keep this open space for when I need extra working or drying space. 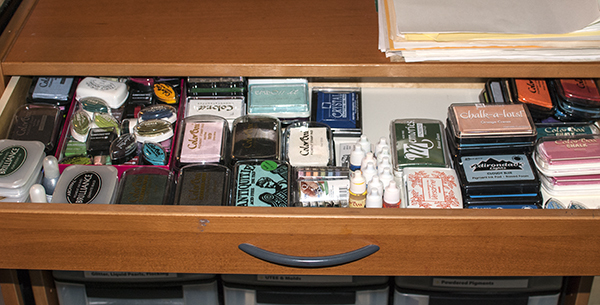 The two IKEA units each have two very wide shallow drawers that I use for storing inkpads and embossing powders. 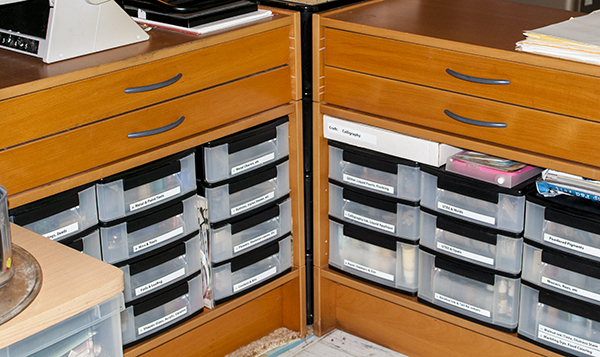 Below the drawers on each unit is a large empty open space that I’ve filled with IRIS desktop drawer units. Notice that the drawer units on the left have four shallower drawers each, while the units on the right each have three drawers, with the bottom drawers being deeper than the two above them. I have mixed feeling about the wide shallow drawers in the IKEA unit. 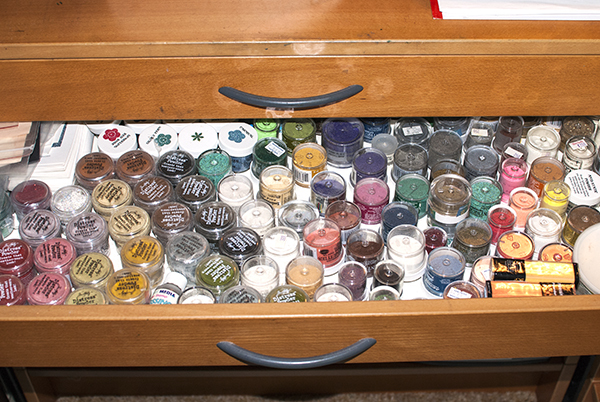 The size of the drawers is excellent for storing a ton of inkpads and embossing powders. 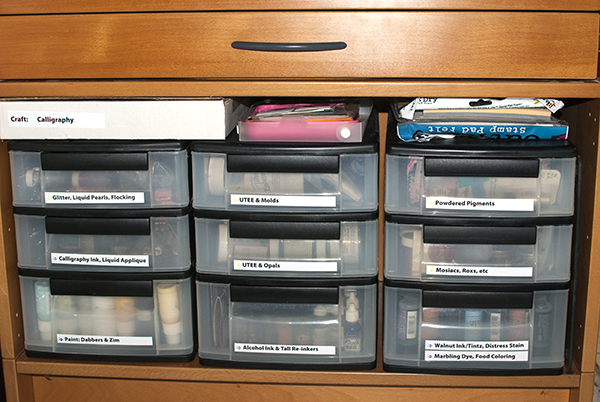 But that ton of supplies weighs a lot and the drawer bottoms tend to sag in the middle in really irritating ways. I don’t think these drawers were really designed for the weight I’m putting in them. I need to ask my husband to look at them and see if they can be tweaked to not sag. The IKEA drawer below it is filled with embossing powders. The ones with solid lids are stored upside down so I can see the powder color inside. They are roughly sorted by powder type and color but they’ve gotten a bit moved around so I need to go back and re-sort them. There are mostly specialty powders on the left and more solid colors on the right. In the lower right corner of the picture you can just see part of a large shallow plastic container where I store a larger amount of clear embossing powder, the type I use the most. Over on the other IKEA unit, the top drawer has pigment inkpads. Again, I’ve got a few shorter re-inker bottles next to the inkpads they match. Notice that there is a pink box on the left side where I’ve got smaller loose inkpads corralled so they don’t wander around in the drawer. The final IKEA drawer has specialty, watermark and embossing inkpads (again with shorter re-inker bottles next to the pads) as well as some blank inkpads. Beneath this drawer are three IRIS desktop drawer units. There is a little space above the IRIS units where I’ve got a box of calligraphy supplies, embossing powder funnels, Inkpad handle hook-and-look tape and Cut ‘n Dry Foam. In these drawers I store: Glitter, Liquid Pearls & Flocking, Calligraphy Ink and Liquid Applique, Paint Dabbers & Zim Paint, Large UTEE Bottles and Molds, UTEE and Opals, Alcohol Inks and a few taller re-inkers that don’t fit into the IKEA drawers, Powdered Pigments, Mosaics and Roxs, Walnut Ink/Tintz, Distress Stain, Marbling Dye and Food Coloring. Most of these things would be messy if they spilled or leaked which makes the plastic drawers good insurance. The IRIS drawers nestled into the other IRIS unit store: Jewelry Findings & Beads, More Beads, Fasteners (Velcro, Brads, Clips), Decorative Punches and Scissors, Metal and Metal Paint/Tools, Wire and Wire Tools, Foils and Leafing, Shapes (Glass, Acrylic, Ceramic), Metal Charms, Buttons, Style Stones, Flowers, Skeleton Leaves and Miscellaneous Charms, and Confetti and Bits. If you walk around to the back side of this little island, you’ll see a stack of large single IRIS drawers that fits in the corner of the L-shape. 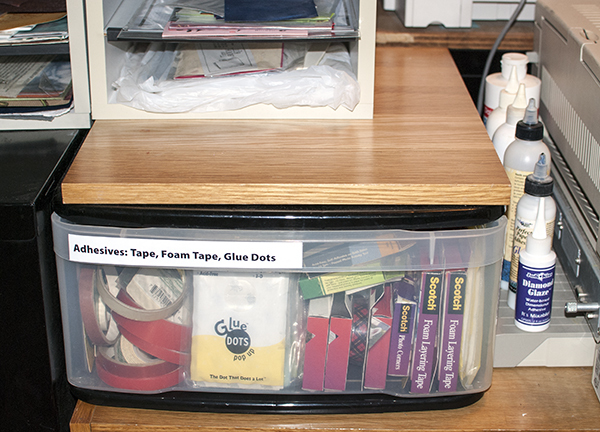 The rest of the adhesives (Tapes, Foam Tape and Glue Dots) are just a few feet away in one more large IRIS drawer. This one sits on an IKEA low bookcase where I store my printer paper. 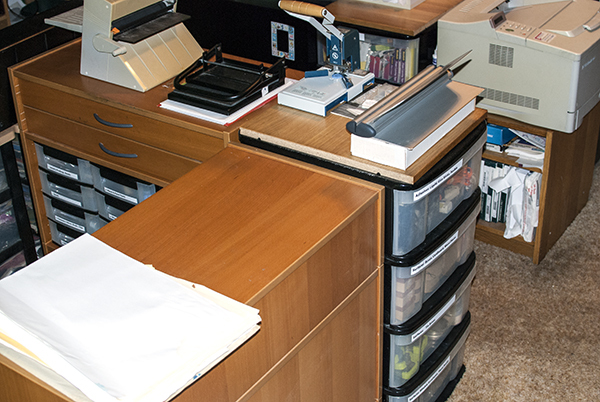 You can see the back of my old HP laser printer on the right side of the picture. Now that I don’t have to print mailing labels for VSN anymore, this printer is just for backup in case I have a problem with my color laser printer so I’ve got a few bottles of glue sitting on the printer tray where they are handy. This IRIS drawer is under the last paper store columns where I store my paper. I originally planned to use the top of this IRIS drawer for my Xyron machine, but decided to spread out the paper storage instead and put the Xyron on the island area across from it. Notice that it too has a piece of unattached shelving resting on top of the drawer, creating a flat surface for the paper storage unit. 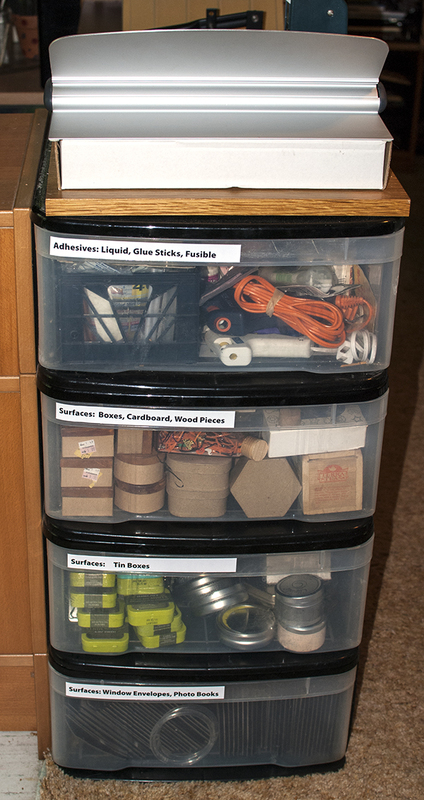 As you can see, most of these supplies are stored in a combination of IKEA drawers or IRIS drawers. 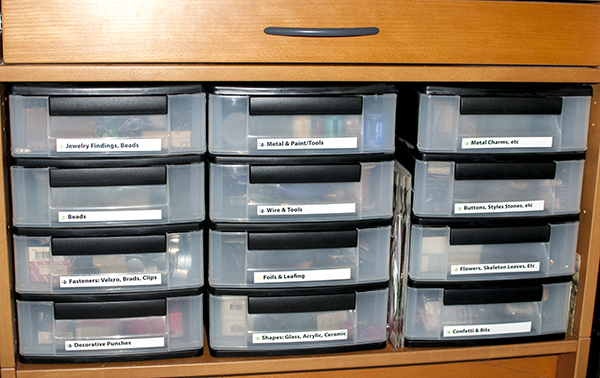 I continue to like IRIS (or similar plastic storage drawer units) for much of my stamping supplies because I find the drawers of varying heights and sizes an efficient way to store supplies. I took pictures of the insides of each of the drawers shown in this blog post. Let me know if you would like to see another post showing the inside of each drawer. Believe it or not, this still isn’t the end of my stamping supplies. I also have supplies in the bottom of a re-purposed TV stand, a chest of drawers and another set of IKEA bookcases. I’ll show you those another day. I hope you find all this interesting and helpful for ideas for your own storage challenges. 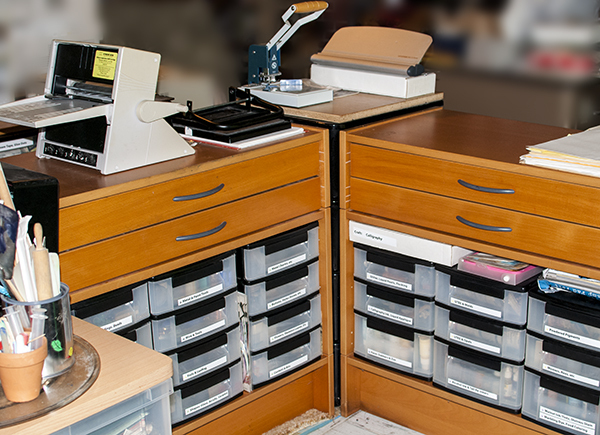 Do you store your stamping supplies in similar ways? What has worked for you and what has not worked for you? I’d love to hear how you store all YOUR stuff! Great storage arrangement Nancie – you must be in 7th heaven with all the room!!! 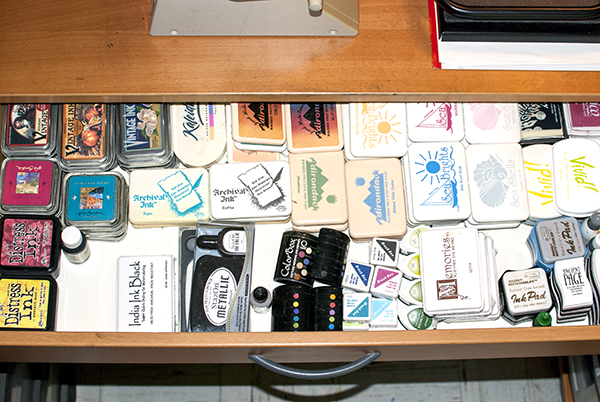 Since the embossing powders get a bit mixed up in that drawer, I wonder if 12″ or longer plastic baskets to fit the depth of the drawer (like Rubbermaid, but the cheaper kind) would help…could store by type and color family. 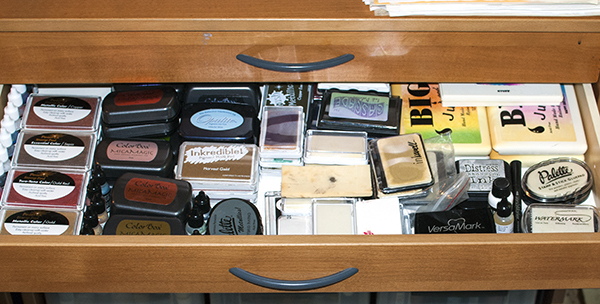 I store my embossing powders, Distress Paints, Distress Stains, and reinkers this way – but since I do not have the drawers I store each in a plastic container or basket on a shelf in my ‘pantry’ next to my desk so I can just pull them out – my version of a drawer. FYI…the cheap plastic baskets I use are 2′ tall by 4 3/4″ wide by 12″ long, and the Rubbermaid trays are 2″ tall by 3″ wide by 12″ long (also come in longer and shorter lengths). I would think the acrylic box picture frames would be too wide if your intent is to be able to remove a tray from the drawer, but would work great just to keep items in place. I configure all my shelves and drawers with these…works great! Visit the thrift stores and see what you can find – LOL!